Everything lacking in the second Avengers movie can be found in Marvel’s latest, Ant-Man. 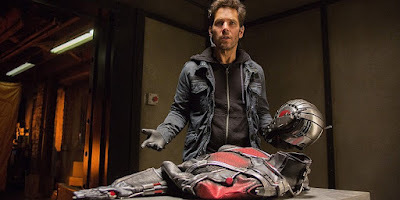 Sly, well-paced and well-plotted, but always a little off-kilter, Ant-Man in the Marvel universe is like the favorite prodigal nephew who’s always unemployed, smells of Jack Daniels, and treats life like one big party. Perpetual screw-up Scott Lang (Paul Rudd) leaves San Quentin after serving time for Robin Hood-ing his past corrupt employers. His little daughter worships him but is now being raised by a new father figure (Bobby Cannavale), a self-righteous cop. After trying to walk the straight and narrow, Scott falls back into crime; breaking into the safe of a retired scientist and only finds some blueprints and an odd suit. 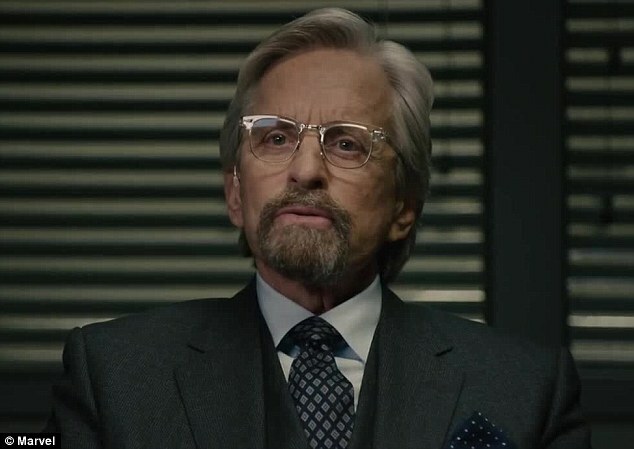 The suit, designed by the scientist (Michael Douglas), grants Lang the power to shrink to ant-size but to have the strength of a giant, making him a perfect weapon against evil. The film had a long gestation period and lost several original creators including its original writer/director Edgar Wright (Shawn of the Dead). Many of Wright’s elements can still be found in the shooting script, including the well-fleshed out characters and humorous pop culture banter. Eventual director Payton Reed, known mostly for TV and minor films such as Down With Love and The Break-Up, steps up, lending the film a whimsical style but still pulling off the action sequences as adroitly as Marvel’s more action-oriented directions. The climax builds, instead of feeling like one generic battle after another, and there’s a true sense of danger for our heroes throughout. The film’s only problem involves its villain Darren Cross (Corey Stoll, The Strain) and his relationship to Dr Pym. The script, and Stoll’s performance, clearly establishes Cross’s narcissistic psychosis. This is a person who truly believes everyone is a supporting player in his central universe. A sick mind damaged by a battle between his inflated ego and his inferiority complex, he has no compunction destroying the world if it proves he’s the smartest. However, he once was Pym’s protégé. Almost as an aside, Pym admits he rejected Cross in the past because he reminded him too much of himself. However, because the movie reveals too little of Pym’s dark side (other than punching out someone who well-deserved it in the prologue), it’s vague why Pym would have ever taken on someone so clearly a sociopath. The film’s futile attempts to use dialogue to fill the holes fail where a well-constructed flashback was necessary. Scott Lang may be the film’s superhero but Rudd is the MVP. His snarky yet earnest persona makes Scotty a lovable scoundrel that audiences beg to see redeemed. The film establishes his craftiness and his outlaw behavior but also bares his adoration for his young daughter. Both his ex-wife (the always dependable Judy Greer) and his mentor remind him that his daughter already thinks he’s a hero, now he just needs to live up to her idolization. The need to succeed for her drives his character arc. Douglas is dependable in the mentor role. He infuses Pym with a savior mentality, and mirrors Lang’s relationship with his daughter, with the rocky but loving bond he has with his child and Girl Friday, Hope (Evangeline Lilly, Lost). Lilly is driven by her character’s anger towards her father, and her need to prove herself to him. She anchors that rage with a well-meaning sense of right. But whoever saddled her with that Louise Brooks flapper wig should be hung out to dry. Not only was the wig unbecoming, it was askew throughout the film as if she had gone to a blind barber. Stoll makes for a tragic villain, one ruled by his insanity and desperation to be idolized. As Lang’s motley crew, Michael Cena, T.I. and David Dastmalchian lend Three Stooges goofiness to the surrounding drama of the climax. 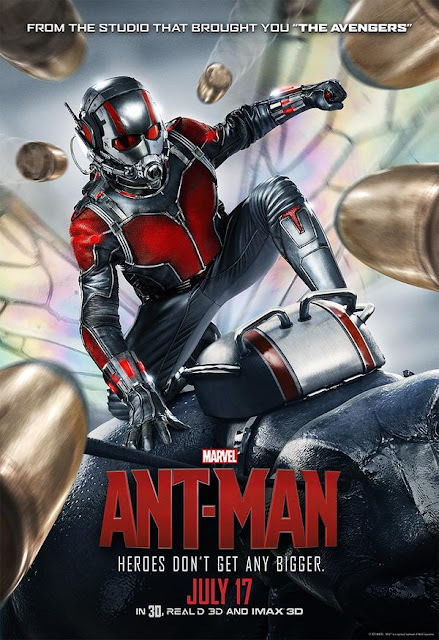 A winner of a superhero, Ant-Man is a wacky but respectful arm of the Marvel universe. Paul Rudd’s performance stands out, along with Mark Ruffalo’s Bruce Banner and Robert Downey Jr’s Tony Stark, as a three-dimensional, layered being, in a two-dimensional world.